We went to the McWane Center last weekend, and while walking past the gift shop, a book caught my eye. And if you think I didn't turn around and make a beeline straight to that book, you don't know me at all. When I got there, I confirmed that it was what I thought it was. 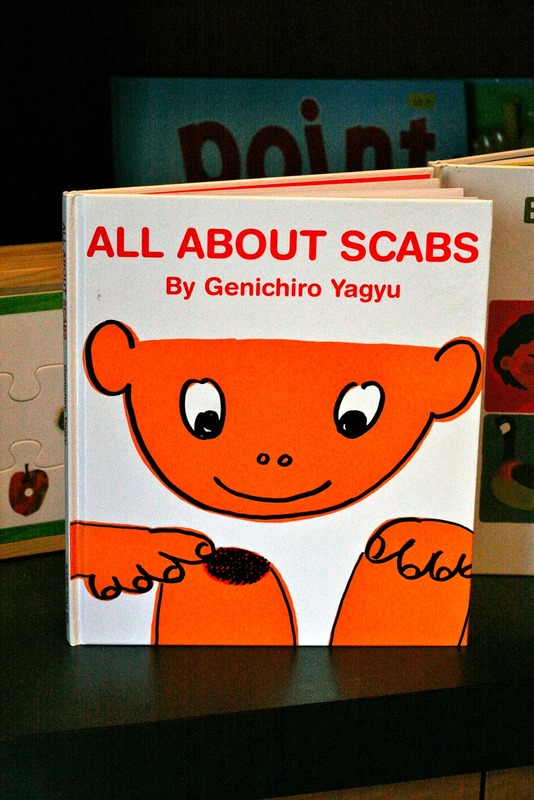 A BOOK ABOUT SCABS. All about them. Just about scabs. I flipped it open to see what kind of gems I'd find inside. And the first page I flipped to didn't disappoint. Eating scabs. Ohhhhhhkaaaaay. I was hesitant to go any farther, but ultimately I decided to look at one more page. AND WAS IMMEDIATELY SORRY I HAD. Internet, I really couldn't take any more. I snapped it shut and went back out to find my family. Of course, NOW I wish I had read more. Just to see exactly how disgusting it got. Yes, I have ever...I'm not sure if it's the same author, but in our library they have a whole series of books on fine topics such as: poop, farts, pee, scabs, boogers, etc. Ah, literature! Gross! Can you imagine all the little boy giggles that would happen if you read this book out loud? Ew! But I'm not even okay about that book with Farts in the title (Ralph the Farting Dog or something?) Good thing I'm not the mother to more boys, right? Paul's aunt gave our boys a book called The Gas We Pass a few years ago. I thought it was in horribly bad taste, but I guess she thought it would be funny. I hated reading it to them but, of course, they had to hear it repeatedly. Strangely enough, the cover had a picture of an elephant on it. I guess with that subject matter it really doesn't matter what you put on the cover. I think the scab book might be worse, though. "Wound poop"? I mean, gag. WHAT IN THE WORLD??? Is it just me, or is it sort of disappointing that the "author" of that book is making money off of something so ridiculous. Ok, I just ordered it used from amazon. I am autistic support teacher and all of my boys have special hygiene issues. This is certainly a needed book. I predict little (and Big??!!!???) boys will love this book and girls of all ages will turn up their noise and say, "Yuck"!! !